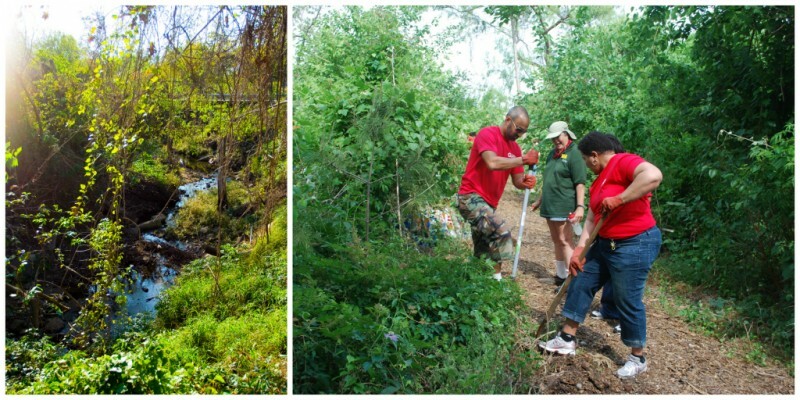 BBP has been working along Japhet Creek for over five years, purchasing more than five acres of property and securing easements that were donated to the City of Houston Parks & Recreation Department. Japhet Creek is a small “green finger” that links Buffalo Bayou north to Clinton Drive in the Fifth Ward. Japhet Creek Nature Conservancy, Japhet Creek Civic Association and hundreds of volunteers have worked tirelessly to remove debris and invasive species while planting native trees, wildflowers, grasses and other vegetation. In addition to improving water quality by naturally filtering water entering Buffalo Bayou, Japhet Creek provides an abundance of wildlife, including a variety of songbirds, red-tailed hawks, herons, swamp rabbits, turtles and fish. Future plans call for purchasing additional property and developing a master plan for Japhet Creek.